Grigor Dimitrov, the talented but streaky member of a generation of men’s tennis players that’s been largely overshadowed by the longevity of the Federer-Nadal-Djokovic cohort, looked poised to break out in 2017 when he started the year by winning 17 of 18 matches, knocking off three top-10 seeds along the way. Playing his best brand of tennis—which is so close in style and movement to Federer’s, it earned him the nickname “Baby Fed”—Dimitrov hit his way to a title in Brisbane, lost a well-played Australian Open semifinal to Nadal, won the Sofia Open, beating David Goffin in straight sets and then...well, then he seemed to fall off a cliff. Yesterday, Dimitrov, who’s hovered around the top-10 for years and reached a career-high ranking of World No. 8 in 2014, lost to world No. 58 and qualifier Jan-Lennard Struff in the round of 32 at the Monte Carlo Open. Before that he lost to No. 385, old man Tommy Robredo in Marrakech. Before that, he was slapped out of Miami in the second round by No. 158 Guido Pella. Of his last six matches, he’s lost five. (The other two losses came before these three head-scratchers: He lost to Goffin in the Rotterdam quarterfinals and a tight match to American Jack Sock at Indian Wells.) He’s failed to reach a quarterfinal in his past four tournaments. Against Struff yesterday, the Bulgarian won the first set handily before losing the second and coughing up the third 6-2. On match point, he sliced a backhand into the net. 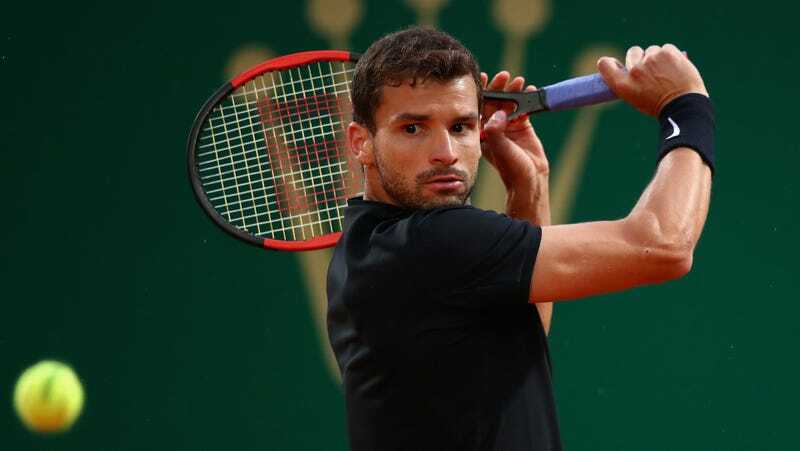 Dimitrov has all the skill to make a run at a major, but tennis as mental a sport as it is physical, and a scoreline like his against Struff suggests Dimitrov desperately needs to improve on that facet of his game. Some pros hit their stride later in their careers. Stan Wawrinka won the first of his three majors when he was 28. That’s still plenty of time for the 25-year-old Dimitrov, but only if he can get out of his own head first.